Some time ago I wrote about a structured learning project I have been working on for some time, called pystruct. After not working on it for some time, I think it has come quite a long way the last couple of weeks as I picked up work on structured SVMs again. So here is a quick update on what you can do with it. To the best of my knowledge this is the only tool with ready-to-use functionality to learn structural SVMs (or max-margin CRFs) on loopy graphs - even though this is pretty standard in the (computer vision) literature. clarification: With ensemble classifiers and ensemble regressors I mean random forests, extremely randomized trees, gradient boosted trees, and the soon-to-be-come weight boosted trees (adaboost). Scikit-Learn 0.13 released! We want your feedback. After a little delay, the team finished work on the 0.13 release of scikit-learn. There is also a user survey that we launched in parallel with the release, to get some feedback from our users. There is a list of changes and new features on the website. There were more than 60 people contributing to this release, with 24 people having 10 commits or more. Again many improvements are behind the scenes or only slightly notable. We improved test coverage a lot and we have much more consistent parameter names now. There is now also a user guide entry for the classification metrics, and their naming was improved. This was one of the many improvements Arnaud Joly, who joined the project very recently but nevertheless wound up being the one with the second most commits in this release! 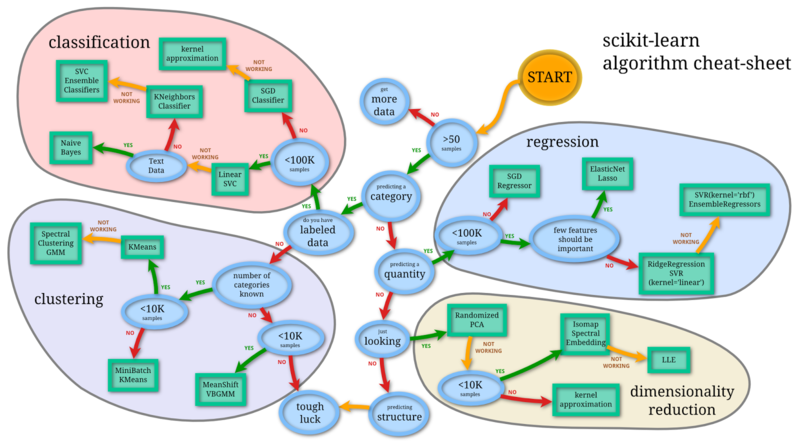 - Thanks to Lars and Olivier, the Hashing Trick finally made it into scikit-learn. This allows for very fast vectorization of large text corpora and stateless transformers for the same. - Sample weights were added to the tree module thanks to Noel and Gilles. This enabled the implementation of a smarter resampling for random forests, which leads to a speed-up of random forests of up to a factor of two! Also, this is the basis of including AdaBoost with Trees in the next release. - I added a method to use totally randomized trees for hashing / embedding features to a high-dimensional, sparse binary representation. It goes along the lines of my last blog post on using non-linear embeddings followed by simple linear classifiers. - I also added Nystroem kernel approximations, which are really easy to do but should come in quite handy. They still need some more work, though. For details, see my post on kernel approximations. Thanks to the team for working on this together. I am really happy with the way everybody joins forces, this is an amazing project! Recently we added another method for kernel approximation, the Nyström method, to scikit-learn, which will be featured in the upcoming 0.13 release. Kernel-approximations were my first somewhat bigger contribution to scikit-learn and I have been thinking about them for a while. To dive into kernel approximations, first recall the kernel-trick.